A splash of bright pink rhubarb purée makes a dramatic addition to any plate. Rhubarb purée is most commonly used in desserts but even when sweetened with sugar it retains enough tartness to hold its own on alongside a piece of pigeon or duck. Not only is it a feast for the eyes, but a drizzle or smear of rhubarb can enliven a dish and be a feast for all the senses. Whole spices can be added to the saucepan with the rhubarb to infuse new flavours, but remember to remove these before puréeing. Big spices like cinnamon sticks and star anise work in both sweet and savoury contexts and are easiest to pluck from the hot rhubarb mixture. A splash of grenadine can be used to intensify the pink colour of the purée. Never worry about making too much rhubarb purée, it has a surprising number of uses in the kitchen. 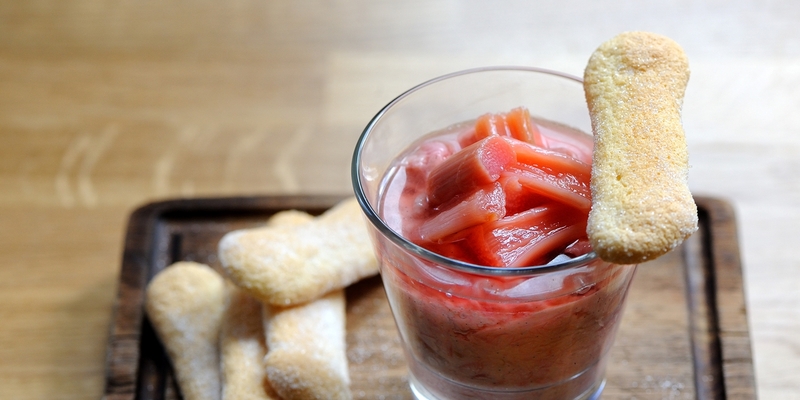 From sloshing some in the bottom of a champagne glass for rhubarb bellinis to drizzling a dash over ice cream, turning leftovers into rhubarb curd or freezing it in ice cube trays to stir into hot porridge, it's unlikely that a delicious rhubarb purée will linger for long. For Michelin-inspiration, look to Daniel Clifford's Vanilla panna cotta which uses rhubarb purée in the dish’s stunningly theatrical plating, or Adam Stokes' recipe for duck breasts, which uses small dots of rhubarb purée as a garnish.